Fresh appraisal of an election that has long been considered the greatest political upset in American history. Gullan, an independent scholar whose work has appeared in the Presidential Studies Quarterly, argues that the election would have been an upset if Dewey had won. He finds the New Deal program had become so institutionalized that the old Rooseveltian coalition simply could not dissolve completely. The partially conservative Truman, leaning somewhat away from the left toward center, more than matched Dewey, also moving toward the center (but from the conservative right of a Republican-controlled Congress that had attempted and failed to roll back the popular New Deal program). 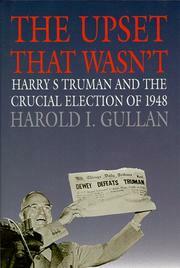 Gullan attributes the Democratic victory, contradicting polls predicting a Republican win, to the greater effectiveness of Truman’s populist cross-country —whistle stop— campaign conducted from the rear platform of a train. Then too, the folksy vice presidential candidate Alben Barkley corralled votes across the South, the Farm Belt, and the border states, unlike the efforts of the dull, uncoordinated Dewey-Warren ticket. The separatist, more extreme parties of Henry Wallace (friendly to world communism) and Strom Thurmond (white-supremacy Dixiecrats) held little appeal to voters. Adding weight to Truman’s candidacy was the highly respected secretary of state, General George Marshall. Prosperity at home and peril abroad also favored incumbents, observes Gullan. He believes that the 1948 election was distinctive in serving as a bridge between party-loyalty-oriented elections and a more independent voter movement, leading later to increased numbers of landslide electoral victories for both Republican and Democratic presidents. Truman, the “square shooter,— enjoyed additionally the special fate of running against the depressing ghost of Herbert Hoover that lingered in American memory. A lucid, enlightening historical survey, as well as a nostalgic look at a bygone era.